Change in Doctor Who is as inevitable as a Kardashian tweeting, a ’90s pop group reforming with fewer members, or a McDonalds drive-through getting your order wrong. And while the latter references are all annoyances, a regeneration of the universe’s most famous Time Lord is something to pay close attention to. So with that being said, how are things looking for the newest TARDIS team now that this brave new era of Doctor Who has begun with The Woman Who Fell to Earth? As it goes, pretty fantastic. A new Doctor, a new showrunner, and a new style always leaves a lot of fans running for the hills, screaming that the series will never be the same again or muttering ominously about the fact that THEIR Doctor will always be the Doctor: how could a change possibly be for the best? Doctor Who has certainly come to something of a crossroads in the last few series; Moffat’s storylines were seemingly not sure what direction they wanted to take. The slight pomposity of referencing the show’s past had started to fall on deaf ears and the story arcs for the later seasons seemed to build too quickly and resolve with too many unanswered questions. So now, with Jodie Whittaker and Chris Chibnall, we have a new order, to quote an old Time Lord, and what a difference a year can make. It seems like forever since the Thirteenth Doctor drew back her hoodie and smiled eagerly at the awaiting TARDIS. The world of fandom (and others – yes, there are other people who only watch Doctor Who occasionally, I promise you) went wild in very different ways and no one knew what to expect. But here we are, and if episode one of Series 11 is anything to go by, we’re in for quite a treat. From the moment Ryan Sinclair (Tosin Cole) begins his soliloquy, one knows that they’re in for a very different Doctor Who experience than ever before. The richness of the camera cinematography, the variation of the characters and their backgrounds, the atmospheric and creepy score by new composer Segun Akinola, and the gorgeous new special effects all add up to something original and new, which is just what the show needed. And that’s only in the first five minutes, before the new Doctor’s even turned up. Money and thought has clearly been spent on this new series and it’s been done in the best possible way. The story itself is a bombastic introduction for the Thirteenth Doctor, down to Earth and out of this world at the same time. To new fans, it should strike the right chord of scary and thrilling, with a touch of levity to reassure them that they’re always in safe hands. 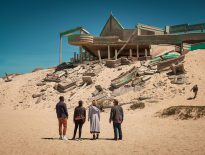 To older viewers tuning back in, there’s a new feel to Doctor Who; Chibnall has taken what he’s learned from showrunning ITV’s Broadchurch (as well as two series of Torchwood) and infused those darker elements into the Doctor’s world. Whilst this may be a continuation of the greatest television show in the universe, it also serves as the best jumping-on point for new viewers in a long time. It feels as if Doctor Who has grown up slightly. 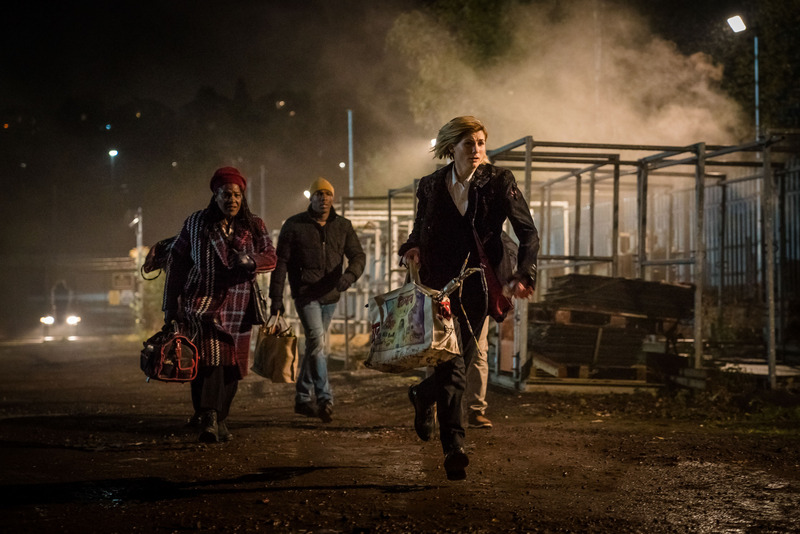 Not to say that there was a problem before – the last 54 years have been tremendously fun, but compare this regeneration story to 2014’s Deep Breath, 2010’s The Eleventh Hour, or The Christmas Invasion and Rose from 2005, and one can see how this Series 11 is a different beast altogether. The Doctor’s new friends all get time to grow from their introductions so we can get to know them as well, letting Chibnall draw his audience in through pathos rather than initial spectacle. 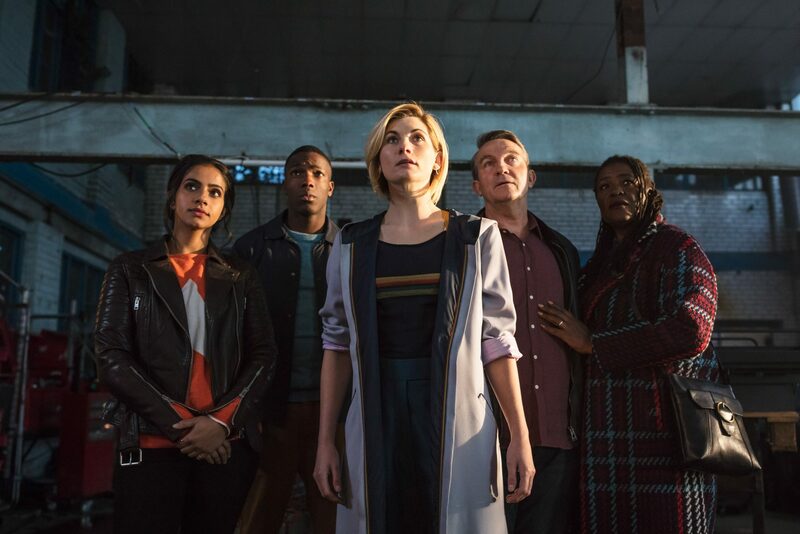 Ryan, Graham O’Brien (Bradley Walsh), and Yasmin Khan (Mandip Gill) are all excellent additions to the world of Doctor Who, with each bringing something fresh to the table. Gone are the days of TARDIS travellers who appear almost obnoxious when ‘calling it as it is’ or are too self-aware that they’re travelling with the Doctor. Our three new eyes from the TARDIS are grounded and everyday, like you or I, and are simply caught up in the maelstrom of the oncoming storm that is the Doctor. By the end of episode one, they’re not given the choice to come along but are thrown into the decision. Again, it’s a fresh way to bring them in without another ‘come with me’ speech from the Doctor, which was wonderful the first few times but surely got a bit repetitive by Series 10. Here we have a homage to the very first series in 1963, with the new TARDIS crew coming along unwittingly, which is no bad thing at all. The final confrontation with the alien of the week is also an excellent finisher too; this reviewer has no head for heights, and a tense standoff atop two very high cranes was a toe curling experience indeed. One might suggest that Chris Chibnall is taking inspiration from the 2006 James Bond reboot, Casino Royale and its tense building-yard fight scenes, but you can decide that for yourself. That’s not to say it’s the most perfect regeneration story that’s ever been crafted. It does have its faults. The alien of the week is great in parts, especially with its tooth covered face, surely one for the kiddies to get scared of. But ultimately it falls flat of being anything less than a mechanism to cajole the story along, rather than being fully three dimensional. 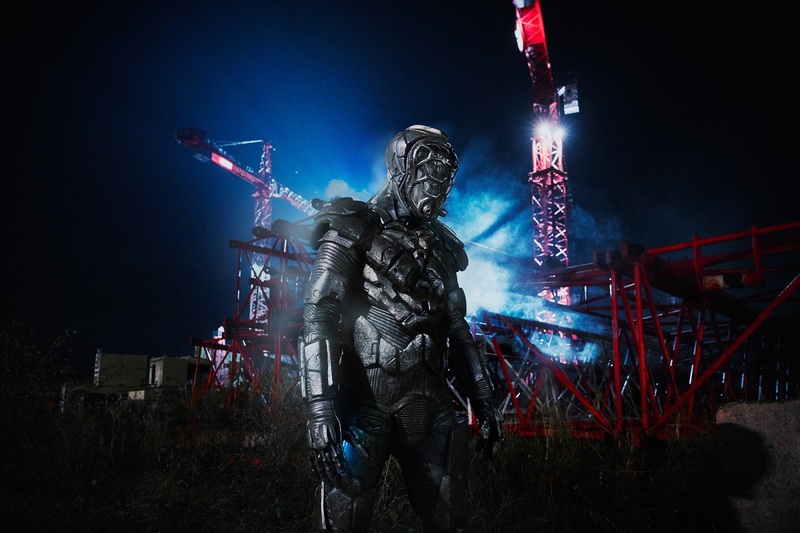 Much like Chibnall’s villain, the Shakri from 2012’s The Power of Three, the build up is better than the reveal. There’s also little time for humour in this episode – it does try and gets a few decent one liners in there but for a show that has done well in having gloriously comic moments following on from the saddest or most terrifying ones, it would have been nice to have a few more jokes in the mix. And what of Jodie Whittaker? Well, she’s the Doctor from the moment she first appears. 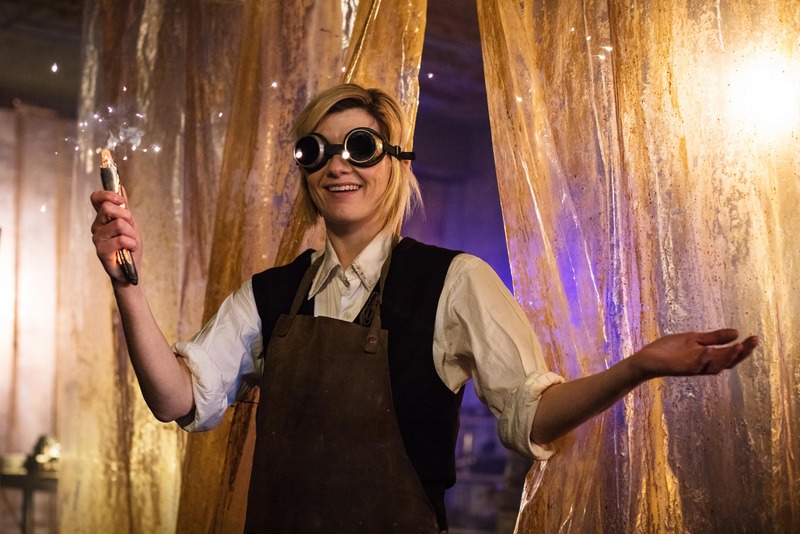 There’s been outcry and rage and bemusement from some that a woman in the lead role would spell the end of Doctor Who but her eager and inclusive performance does completely the opposite, fortifying Doctor Who and putting it back where it belongs as appointment television. She breezes through her first official hour with the swagger and confidence that one would want from their Doctor; she’s all of the past and all of the future rolled up into one unique Time Lord. This reviewer can’t wait for more of her Doctor. 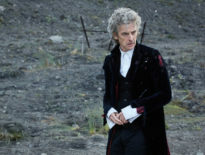 Doctor Who is back, and rather than looking over its shoulder or doubting itself or having another encounter with the Cybermen, it’s a fresh show with a new message. The new Doctor is officially in, sorting out fair play throughout the universe and we’re in for one hell of a ride.